Since October 2016, when militants from the Arakan Rohingya Salvation Army (ARSA) attacked three border police posts in Myanmar’s Rakhine State, developments in that part of the world have dominated the headlines. Denied access to western Myanmar, most reporters have focussed on the plight of the 600,000 or more Muslim Rohingyas who are now living in squalid refugee camps in Bangladesh. Given the nature of the crisis, described by the UN as ‘a humanitarian and human rights nightmare’, and ‘the largest mass refugee movement in the region for decades’, the flood of reports about the Rohingyas in the news media and online is understandable. However, a few important issues have slipped through the cracks and demand closer attention. There have been passing references in news stories to the ‘area clearance operations’ conducted by Myanmar’s armed forces (Tatmadaw) and police force, and countless reports of specific incidents, but few observers have stepped back and tried to examine the broad strategy being pursued by the security forces in northern Rakhine state. Yet without an understanding of their long term military and political goals, it is difficult to look beyond current problems and anticipate future challenges. It is widely acknowledged that Aung San Suu Kyi’s government, while hardly blameless, has little control over the security forces, which seem to be pursuing an agenda of their own. However, what that agenda might be, and the thinking behind it, are difficult to determine. Broadly speaking, four schools of thought have emerged to explain military operations in Rakhine State. They range from the plausible to the improbable. First, the official line is that the security forces are responding to a serious threat to Myanmar’s unity, stability and sovereignty from Rohingya terrorists, who are supported by international Islamist groups. Naypyidaw has offered few details to back up these statements, preferring to emphasise the attacks against 34 police and army posts over the past year, the 21 soldiers, policemen and civil servants killed in the line of duty, and the need to recover the arms captured by ARSA. As always, hard data is scarce, but the International Crisis Group (ICG) is probably right in stating that ARSA does not have a transnational Islamist or jihadist agenda. That said, questions remain over its possible connections with other extremist groups. Also, as the ICG has warned, there is the potential for the Rohingya crisis to be exploited by foreign terrorists, and for them to launch attacks both in Myanmar and abroad. Naypyidaw is not alone in taking such threats seriously. Regional governments have expressed concern over the emergence of a new Rohingya militant group and the spread of religious violence. Quite apart from the presence in Thailand, Malaysia, India and elsewhere of thousands of exiled Rohingyas, South and Southeast Asia’s Muslim communities have reacted strongly to the harsh treatment accorded to their co-religionists in Myanmar. After what appears to have been a rather confused response to the initial ARSA attacks, Myanmar’s security forces have reportedly implemented a comprehensive ‘four cuts’ counter-insurgency strategy to deprive the militants of food, funds, intelligence and recruits. As seen elsewhere in Myanmar, this is essentially a scorched earth policy under which villages are burned, crops destroyed, minefields laid and populations displaced. A second school of foreign observers has seen this strategy as a massive over-reaction to a minor threat from a small band of poorly armed and ill-trained Rohingya exiles and their local supporters, driven to act by decades of institutionalised persecution by successive Myanmar governments. Indeed, an ARSA military victory was never a realistic proposition, suggesting that its leaders deliberately provoked an excessive response by the security forces to attract international attention and raise support for the Rohingya cause. Also, ARSA’s leadership knew that anti-Muslim feelings were rife in Myanmar and the Rohingyas were reviled as illegal Bengali immigrants. Whether or not Naypyidaw gave specific orders to terrorise Rohingya communities, ARSA would have known from other conflicts in Myanmar that poor leadership and lax discipline, combined with racial and religious prejudices, would lead to widespread human rights abuses. It doubtless anticipated that this too would generate international sympathy for the Rohingyas. A third school of analysts believes that the generals seized on the ARSA attacks in 2016 to launch a long term plan to expel all Rohingyas from northern Rakhine State. A second round of ARSA attacks in August 2017 gave this strategy of ‘ethnic cleansing’ added impetus. It has been suggested that, under such a plan, the Rohingyas were to be driven into Bangladesh and physical obstacles such as barbed wire fences and minefields put in place to prevent their return. According to this theory, any Rohingyas able to survive the stringent citizenship ‘verification process’ and cleared to return to Myanmar would be resettled further south, where they would be less susceptible to manipulation by Bangladesh-based extremists. The Rohingya lands left vacant in the north could be reallocated to Rakhine Buddhists. This would create a cordon sanitaire between Myanmar and Bangladesh populated by Naypyidaw loyalists, organised into local militias to provide additional security. The fourth school consists of those popular pundits who insist on seeing the Rohingya crisis in terms of a global conspiracy. A few have even described it as a proxy war between the great powers, with the US (helped by its ally Saudi Arabia) somehow using the Rohingyas to undermine China’s influence in Myanmar. Another commentator has suggested that the US and EU precipitated the crisis in order to interfere in the internal affairs of Myanmar, which was described as a US ‘client state’. No serious observers entertain such far-fetched notions. However, the other explanations put forward to account for the behaviour of the army and police deserve consideration. It would be surprising if the Tatmadaw high command was not exploiting the Rohingya crisis for its own purposes. The generals are already flexing their muscles in Naypyidaw, reminding Aung San Suu Kyi’s government of the armed forces’ continuing key role in national affairs. 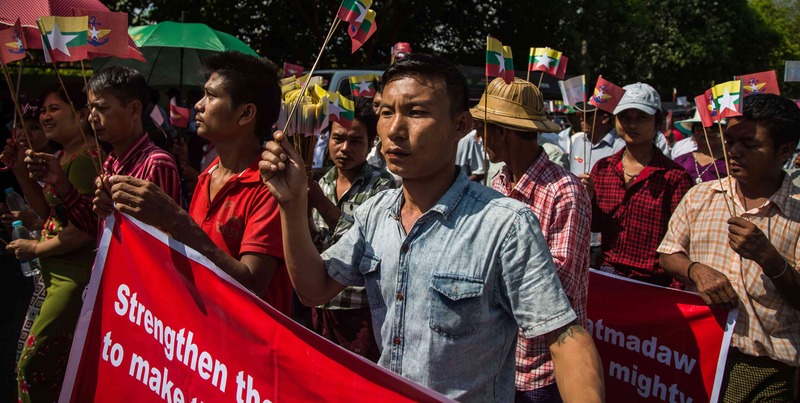 They are also capitalising on anti-Muslim sentiments in Myanmar to reinforce their claim to be the defenders of the country’s majority Buddhist culture. And a long term solution to the so-called ‘Rohingya problem’ has always been a high priority. Regardless of whether the Tatmadaw’s strategy has been dictated by genuine security concerns, crude nativism, political opportunism or a secret plan permanently to change the ethnic balance of northern Rakhine State, one thing is clear. Myanmar’s security forces are determined to pursue their own agenda. Aung San Suu Kyi may be responsive to foreign demands for more humane policies, but the generals are unlikely to be persuaded to change their long term goals by anything the international community might say or do.